1. 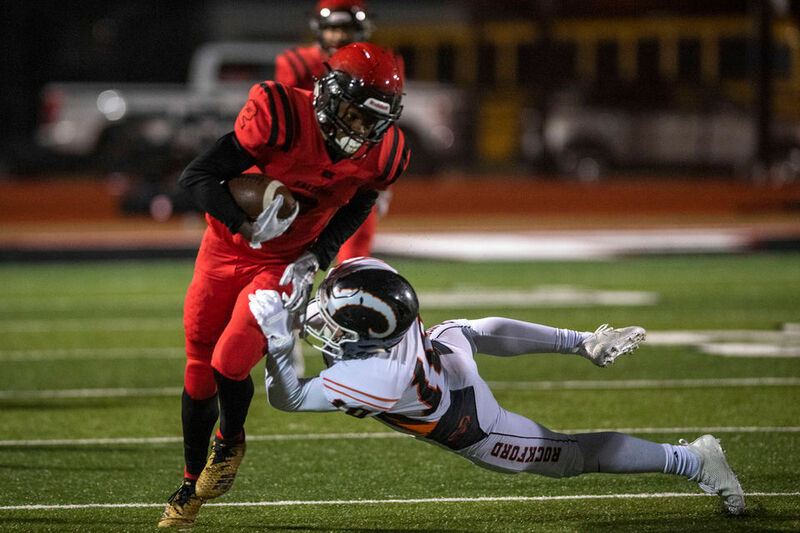 Kionte Blakely, East Kentwood: The 5-foot-6, 160-pound jitterbug, pinball -- whatever you want to call him -- did his thing again Friday before an injury sidelined him. He rushed for a game-high 195 yards and two touchdowns on 15 carries in essentially one half. Falcons coach Tony Kimbrough said that Blakely suffered a possible hip-flexor injury, although Blakely wanted to go back in the game after suffering it. 2. 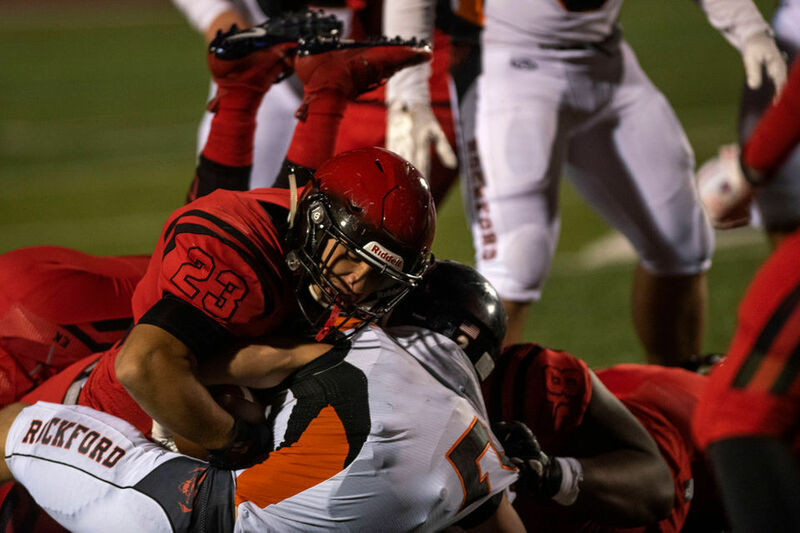 Joshua Ledesma, East Kentwood: The 5-foot-11, 225-pound junior fullback/linebacker was all over the place on defense, posting a co-game-high 14 tackles. When Blakely left the game with his injury, Ledesma helped carry the load, rushing four times for 17 yards and two TDs in the second half. His second TD was a display of power and will, as he kept fighting until he got into the end zone. 3. 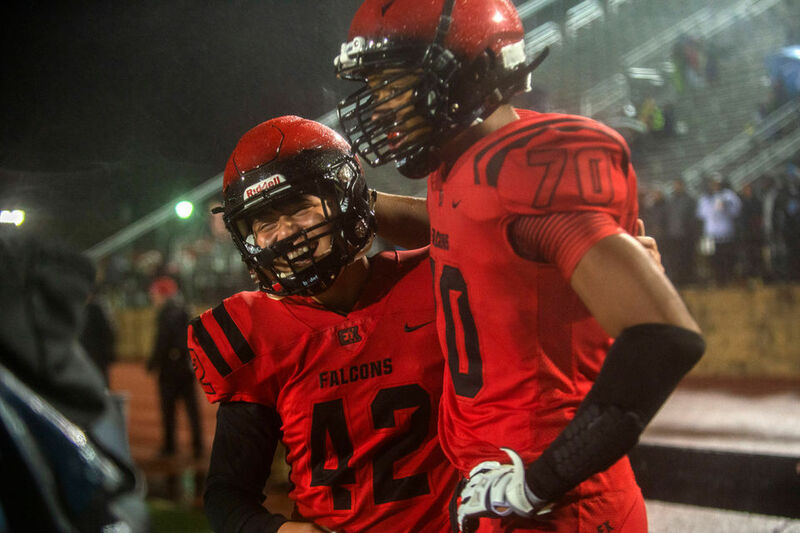 Mazi Smith, East Kentwood: The 6-foot-3, 320-pound defensive lineman was a force in the middle for the Falcons. The University of Michigan commit racked up a co-game-high 14 tackles and forced a fumble. Rockford coach Ralph Munger declined to be recorded on video, but he shared his thoughts on his team's inability to overcome miscues in the way that a team like East Kentwood can. "We get a 15-yard penalty, I'm not happy about it. Well, you know what? Those kids (East Kentwood) can make it up and just keep going," he said. "We're not at that point, we're not at that level. We need to keep busting our hump and avoid things that will beat you. And, tonight, we didn't do a good job of that." 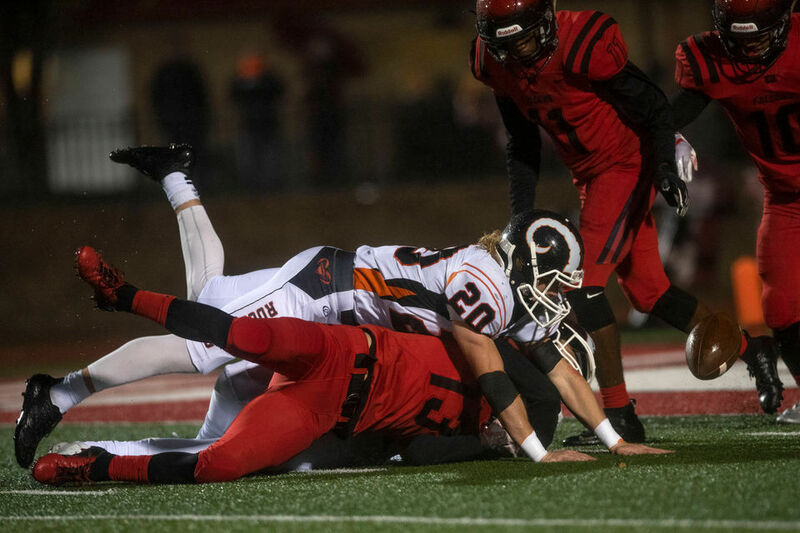 Not only was Rockford playing for a share of the OK Red Conference title Friday, but the Rams were trying to get in the playoffs for a record 24th-straight year. The last time the Rams missed the playoffs was 1994, when they finished 3-6. For a 17-year stretch spanning 1996 to 2012, Rockford posted double-digit wins in 11 seasons. The Rams advanced to at least the district finals in each of the previous 15 years. They'll learn their postseason fate Sunday, when the 256-team playoff field is unveiled on the Selection Sunday Show at 7 p.m. on Fox Sports Detroit. 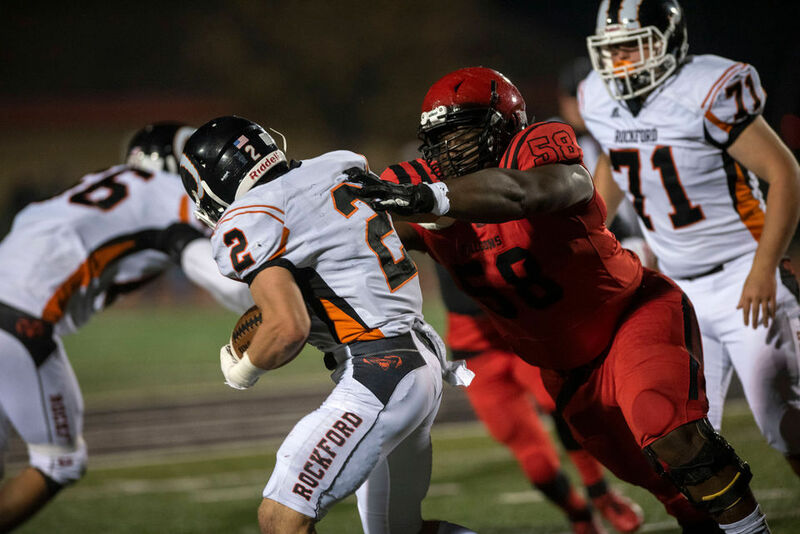 A tight all-time series between East Kentwood and Rockford got even tighter with the Falcons' win Friday. The Rams still hold an edge, but just barely at 26-25. East Kentwood wasted no time at all, marching 80 yards into the teeth of the wind on a four-play drive, capped by Kionte Blakely's 8-yard touchdown run to strike 1:18 into the game. Blakely carried the ball three times for 51 yards on the drive. A 41-yard pass from Kyle Dent to Stephan Bracey set up the Falcons first-and-goal. Rockford answered on its first possession of the game, going 79 yards in eight plays. Eli Haddad got behind the East Kentwood secondary and hauled in a 47-yard TD pass from Chris Corey to knot it at 7 just past the midway point of the quarter. Blakely finished the quarter with 82 yards on seven carries. After the teams traded possessions, the Falcons went to Blakely twice and that's all that was necessary to go back in front. He first ripped off a 29-yard gain to the Rockford 45, then on the very next play Blakely went 45 yards for a TD, making a great cutback, splitting a couple of defenders and racing to the end zone. Blakely, who left the game late in the first quarter with what appeared to be cramps, had a big first half with 195 yards and two TDs on 15 carries. The Rams dominated possession and cut into their deficit with a time-consuming drive opening the third quarter. They moved the ball 53 yards in 12 plays, capped by Teagen Lenderink's 43-yard field goal with the wind at his back. The drive ate up more than seven minutes. That pulled Rockford within 14-10 with 4:43 left in the quarter, and it was the only scoring of the quarter. The Falcons created a little breathing room early in the fourth, as Bryce Mostella recovered a Rockford fumble on the Rams' 32 on the second play of the quarter. Four plays later, fullback Joshua Ledesma scored on a 4-yard run to put East Kentwood up 21-10 with 9 ½ minutes left in the game. East Kentwood's defense held again on Rockford's ensuing possession, forcing a turnover on downs at the Rams' 35 with about 5 minutes left. Two plays later, Ledesma got in the end zone again, this time on a hard-charging 10-yard run with 3:31 remaining for a 28-10 lead. After a nice kickoff return by Luke McLean to midfield, the Rams scored on a 24-yard pass from Corey to Nate Bareno to cut their deficit to 28-17, but that came with 0.6 seconds left. 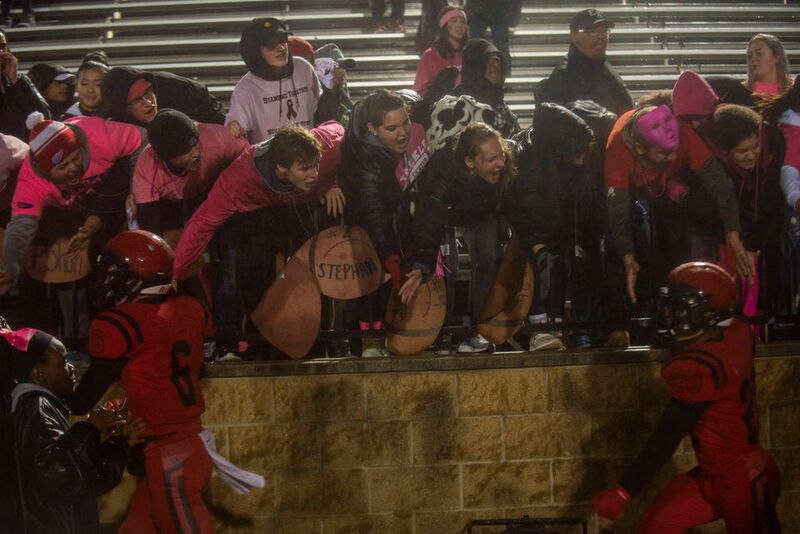 East Kentwood recovered the squib kick, and the celebration commenced. EK: Kionte Blakely 8 run (Christian Tanner kick), 10:42. R: Eli Haddad 47 pass from Chris Corey (Teagen Lenderink kick), 5:48. EK: Blakely 45 run (Tanner kick), 6:03. R: Lenderink 43 field goal, 4:43. EK: Joshua Ledesma 4 run (Tanner kick), 9:26. EK: Ledesma 10 run (Tanner kick), 3:31. R: Nate Bareno 32 pass from Corey (Lenderink kick), 0.6. 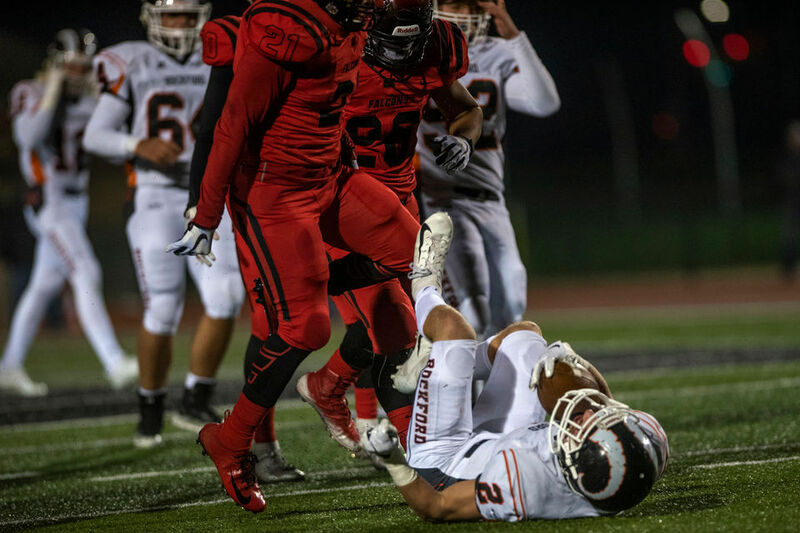 Defense: Mazi Smith (East Kentwood) 14 tackles; Joshua Ledesma (East Kentwood) 14 tackles; Austin Klein (Rockford) 11 tackles.